VOA Radiogram this weekend will include news about reductions to the shortwave transmissions of VOA and other stations of US international broadcasting. These cuts were effective on 30 June. Fortunately, VOA Radiogram remains on shortwave, at least for now. The Mighty KBC will transmit a minute of MFSK64 Saturday at about 1130 UTC on 6095 kHz, and Sunday about 0130 UTC (Saturday 9:30 pm EDT) on 9925 kHz. Both frequencies via Germany. Reports to themightykbc@gmail.com. This entry was posted in Broadcasters, Digital Modes, News, Schedules and Frequencies, Shortwave Radio, What's On Shortwave and tagged Digital Modes, Digital Text, Digital Text over Shortwave, Kim Elliott, VOA, VOA Radiogram, Voice of America on July 4, 2014 by Thomas. This entry was posted in Broadcasters, News, Shortwave Radio, What's On Shortwave and tagged Digital Modes, Digital Text over Shortwave, STF Radio on April 16, 2014 by Thomas. “STF Radio is primarily a narrowcasting project, a means to deliver specialized content to specific audiences in remote locations. And due to the nature of shortwave, we’re inviting the world to listen in. The (possible) series of special multimedia broadcasts will continue the exploration of new possibilities with aging technology. We are currently preparing a 1-hour program for broadcast later in April. Depending on audience response, there may be additional programs throughout the year. If you would like to decode STF Radio International‘s broadcast, tune in The Might KBC on 7,375 kHz, April 6, 2014 from 00:00 – 2:00 UTC (Saturday evening in North America). STF indicates that their broadcast will be between 01:30 – 2:00 UTC. This entry was posted in Broadcasters, Digital Modes, News, Schedules and Frequencies, Shortwave Radio, What's On Shortwave and tagged Digital Broadcasts, Digital Text over Shortwave, Shortwave Digital Broadcasts, STF Radio, The Mighty KBC, VOA Radiogram on April 5, 2014 by Thomas. VOA Radiogram: Battle of the 100 wpm modes, this weekend! If you like the VOA Radiogram, don’t miss this weekend (March 29-30)–a one year mile marker for the VOA Radiogram service on shortwave radio. I’ve copied details of the broadcast below, but please bookmark or subscribe to the VOA Radiogram website to see the results of the 100 wpm battle and details of all future broadcasts. This weekend, 29-30 March 2014, will be program 52 of VOA Radiogram. This means that VOA Radiogram has survived one year of shortwave broadcasting. 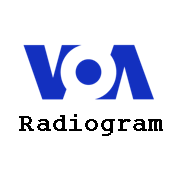 VOA Radiogram has been successful because of its audience: tuning in, decoding, experimenting, and sending in reports. We will mark one year of VOA Radiogram with a “battle of the 100-word-per-minute modes.” The same VOA News story will be transmitted using four modes that have a speed of more-or-less 100 words per minute. Each mode will be preceded by 5 seconds of silence, followed by the RSID, 5 more seconds of silence, and the RSID again. The Mighty KBC, via Germany, will again transmit a minute of MFSK64 Saturday at about 1230 UTC on 6095 kHz and Sunday at about 0130 UTC on 7375 kHz. (KBC’s change from 7375 to 9925 planned for this weekend has been postponed until May.) STF Radio International will also have a minute of digital modes during the same hour (simultaneous MFSK32 streams at 1500 and 2100 Hz). This entry was posted in Broadcasters, Digital Modes, International Broadcasting, News, Shortwave Radio, What's On Shortwave and tagged Digital Modes, Digital Text, Digital Text over Shortwave, Kim Elliott, VOA, VOA Radiogram, Voice of America on March 28, 2014 by Thomas. This entry was posted in Broadcasters, Digital Modes and tagged Digital Images over shortwave, Digital Text over Shortwave, Kim Elliott, VOA, VOA Radiogram on September 21, 2013 by Thomas.